Versailles’ Taylor Winner has been named The Daily Advocate’s girls track and field athlete of the year, Greenville’s Aaron Balsbaugh has been named The Daily Advocate’s boys track and field athlete of the year, and Greenville’s Evan Kiser has been named The Daily Advocate’s boys tennis player of the year. 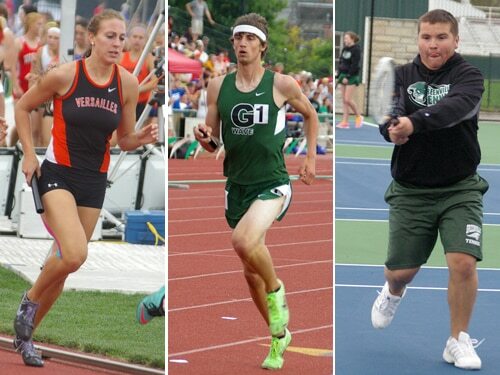 DARKE COUNTY – A trio of senior athletes who excelled throughout their high school careers this the Daily Advocate’s MVPs for boys tennis, boys track and field and girls track and field. Winner qualified for state in four events – the 4×100 meter relay, the 4×200 meter relay, the 4×400 meter relay and the 4×800 meter relay. She was the lone Darke County track and field athlete to qualify for state in four events this year. Winner helped guide the Lady Tigers to a second place finish in the 4×400 meter relay, a 10th place finish in the 4×200 relay, a 12th place finish in the 4×100 relay and a 16th place finish in the 4×800 relay. The Versailles senior led all Darke County girls in the 800 meter run with a time of 2:27.04. Winner qualified for state all four years of her high school track and field career. She won the 4×400 meter relay championship as a sophomore along with sister Meagan Winner and cousins Amanda Winner and Haley Winner. As a freshman she helped guide the Tigers to the Division III team championship. Kiser spent the majority of the season playing first doubles and compiled a 15-7 record in the first doubles spot. Kiser played three singles matches at first singles and won each time. “The times I did put him at singles, again best for the team, he did win all three of the singles matches that he played,” Coach Kiser said. Kiser and teammate Adam Null won the first doubles championship at the Greater Western Ohio Conference Gold Flight tournament. The duo earned first team all-GWOC North honors for their play this season. The Green Wave senior teamed up with Noah Haupt in the Ohio High School Athletic Association tournament and came up just one win short of advancing to the district tournament. Kiser, who played four years of varsity tennis, finished his high school career fifth in Greenville history in career wins with an all-time record of 68-31. Kiser also holds Greenville’s record for single season wins at first doubles, a mark he set two years ago with Sam Bowers.